My main use for ifish is having regulations in my pocket at all times. My main use for ifish is having regulations in my pocket at all times. We camp a lot and are all over Ontario. I also have used the proximity search a few times and fished lakes I otherwise would not have known about. It's made a not so great fishing trip spectacular when the main lake we are camping on turns out not so great for fish. My wife doesn't fish, so not all camping destinations are chosen for excellent fishing. I've found the irish Ontario app to be a complete waste. I have no idea where they get the info from but they show species in lakes that have never had them, ever. So far my experiences with apps is less than stellar. Most are just reasons for folks to part with money. Solid research will give you much better info than any of these apps ever will. Ifish Ontario is pretty good. Worth the $5 Has a little write up for most lakes in Ontario, does a gps proximity search of the area your in and tells you what lakes are close. Has regulations built in. Alot packed into one app. It's a lot like the Ufindfish app, but has more and doesn't crash all the time. 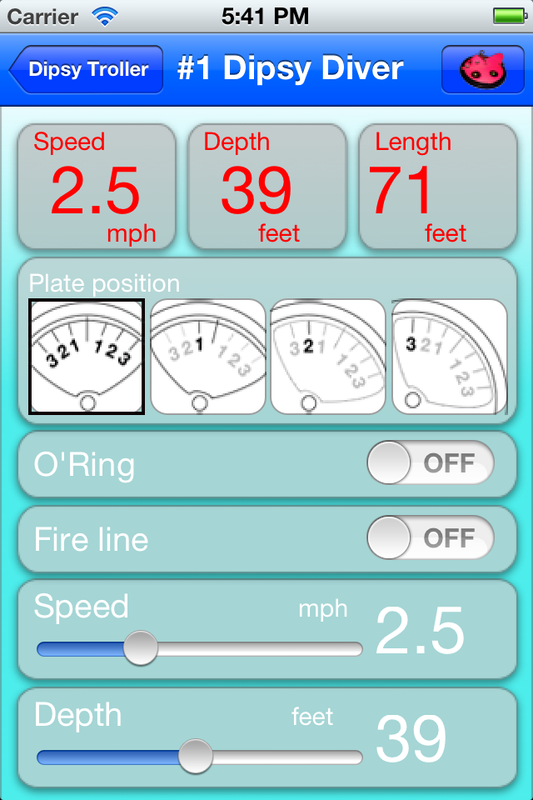 Another great app is Gps Speedometer. Has a great display, I use it almost every time I'm out trolling. And it's free. does this app require 3G? Yes, you input the dispy style or other divers/leadcore and input the speed and whether or not you are using the o-ring and input desired depth and it calculates the line out needed. Or you can do it the other way around and put in the line out and it will calculate the depth. There isn't an input for the line weight so assume it uses the average 20lbs mono as the standard. That's the only short coming I see. Wait, how does that dipsy app work? You input the variables such as dipsy diver style, line wieght, speed, other factors, desired depth? And it will tell you how much line to let out? Useful app. Nice and simple interface. Can quickly dial in your speed, and depth wanted and it will show how much line is needed. Pretty slick for the price of a can of coke. Beats carrying charts. Not sure if available on Android. One for iPhone is called launch sites. Show confermed launches and if any fees are payed. Plus general info about the lake and quality of the launch. I have recently been added to the Pro Staff line up for UFINDFISH. If anyone is interested in how to use this app with their Android or iPhone please give me a PM. We are working on its compatibility with Blackberry and expect results soon. 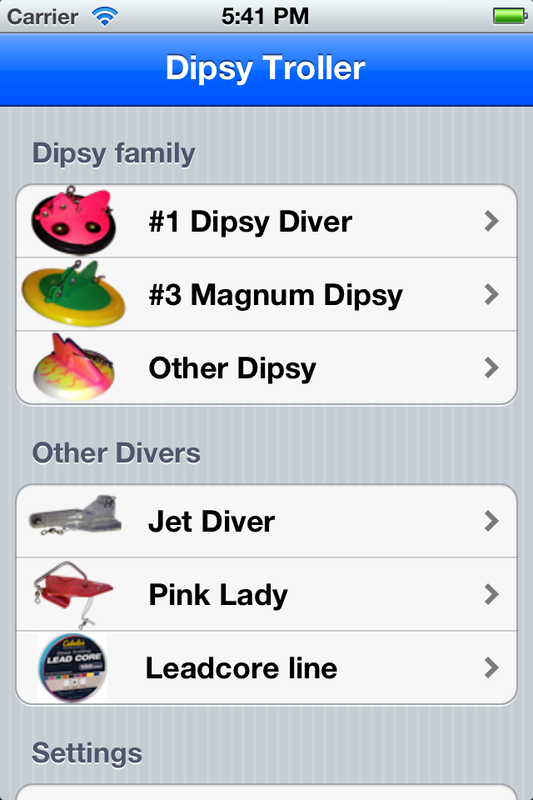 Its a great tool for your own use or to share with others on UFINDFISH. apparently they are still working out some bugs, and for $10 it might be worth waiting for them to get that squared away, but there are some interesting features on it for sure- assuming they work as advertised. musky activity gauge, a proprietary function which is based on something like 20 factors that influence musky behavior (moon periods, sun, current weather, weather forecast, barometric pressure, etc.). It gives a full prediction for the next 24 hours and the activity spikes it indicates (both good and bad) match what is going on in the environment. For example, a dropping barometer around moonrise will show a positive spike (just as most musky anglers would expect) and the app will predict such instances for the next 24 hours. The lure selector and fish location functions have numerous answers for each variable and contain a tremendous amount of data. Fish view applies a filter that allows you to view how your lures look given the water color you are fishing and the sky conditions, and could be very helpful. Really good launch site app called Launch Sites .. much better than Austin Kayak's poor app. The launch sites app is also available for Android, very helpful when in a new area. Hey guys thought I would contribute here to what I think is a must have app. Before going any further it seems this is only for the iphone/ ipad. Basically this app is a mapping and tracking app with tons of features. To keep this short here are my favorite features. Dashboard: Track your direction, speed, pace, time and track time all in one screen. Maps: Choose between a ton of different maps, even add custom maps. My favorite part is the ability to save maps for offline, for example I saved a multi-layered Google Map of Lake Simcoe. I went out in the yak, no cell service and used the maps in offline mode . So there you have it. That's my recommendation for a handy fishing app. My only gripe is the price, $9.99. It's a bit steep in my opinion but a great app none the less.